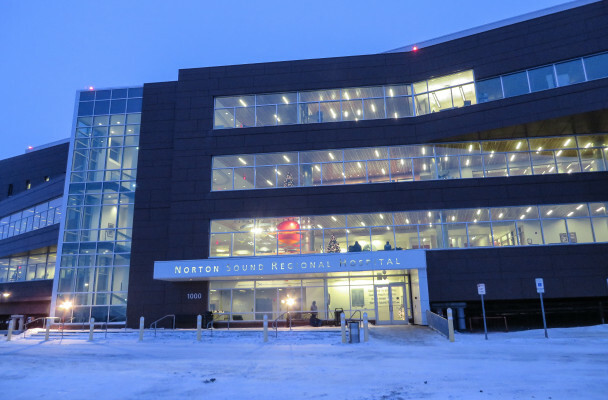 The Liitfik Wellness and Treatment Center will eventually live in a new, two-story building across the street from the Norton Sound Regional Hospital (pictured), according to NSHC President Angie Gorn. Gorn — president and CEO of NSHC — said the region needs its own space to help people dealing with alcoholism, substance abuse, suicide, and other effects of historical trauma. That something is shaping up to be the Liitfik Wellness and Treatment Center. In the short term, it’ll provide people with a safe place to detox. And in the long term, it’ll offer intensive outpatient therapy. The goal is a new, two-story building across the street from the Norton Sound Regional Hospital, just west of the patient hostel. Gorn said NSHC considered renovating the old hospital building before learning the remodel would actually cost more than building new. Eventually, the first floor of the wellness center will house Behavioral Health Services (BHS), the detox facility, and the Liitfik treatment program. The second level will have space for health aide training, EMT training, public health nursing, and more. Myra Murphy — the Liitfik Program Developer — said the idea is to bring these related services under one roof, so it’s easy for patients to find continuing support as soon as they walk out of detox. And with the growing number of patients, Murphy said that’s an urgent need. In just the last year, she said the number of BHS patients has increased by a thousand. And that takes a major toll on the community — not just in crime and costs, but in the culture and attitudes surrounding wellness. For that reason, Murphy said it’s crucial that there be a treatment center in the region. With the new facility, Murphy said people struggling to stay sober in their villages can come to nearby Nome rather than other faraway treatment options. And for those who do need to leave the region for an even greater level of care, she said the center can serve as a stepping-stone and ease the transition. Preliminary drawings for the treatment center were finished two years ago by Fairbanks firm Bettisworth North, and now they’re in the final design phase. Gorn said they hope to have plans totally finalized in the next year and a half. Without designated funding, though, Gorn said there’s no final timeline for construction. She said the treatment center is a priority for NSHC’s capital project planning, but they’re also pursuing grants and other funding options.